MCM hobo bag in signature logo-print coated canvas and leather. Removable flat top handle, 7.9" drop. Recessed, extended zip top closure. Exterior, individually numbered logo plate at front. Metal rings clinch sides of bag. Interior, one zip pocket. 12.6"H x 12.6"W x 5.9"D. "Klara" is imported. 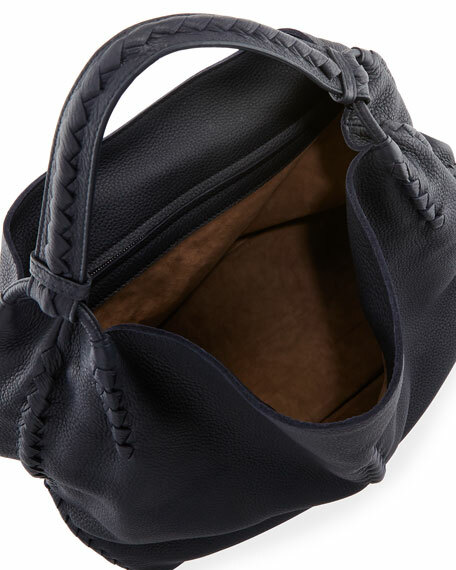 Rebecca Minkoff hobo bag in Nylon. Tabbed top handle. Dipped zip top closure with ring/tassel pull. Exterior, zip pocket at side. Interior, fabric lining. One zip pocket. 16"H x 24"W x 4.5"D. Imported. Rebecca Minkoff pebbled leather hobo bag with silvertone hardware. Removable flat top handle, 7" drop. Removable, adjustable shoulder strap, 19"
Rebecca Minkoff pebbled leather hobo bag with silvertone hardware. Removable flat top handle, 7" drop. Removable, adjustable shoulder strap, 19" drop. Zip top. Exterior, side zip pocket, logo detail at back. Interior, one zip pocket. 11"H x 16"W x 2"D. Imported.